My friend the dictionary has let me know not only that I've misunderstood the word nonplussed but that everyone around me misunderstands it too. "It's a lot more work than high school was." "Well, I'm sure he's nonplussed about it." "Oh, he's plussed. He's a little plussed." Please imagine my rejoinder as Larry David might deliver it, for this conversation is as close as I've ever come to having life imitate Curb Your Enthusiasm. To bring to a nonplus or standstill; to perplex, confound. Freq. in pa[st]. p[artci]ple. (cf. NONPLUSSED adj.). The words go back to the Latin non plus, meaning "not more," "no further." An OED sample sentence, from Josephine Tey's novel The Franchise Affair (1949): "Now, seeing the actual physical Betty Kane again, he was nonplussed." Realizing my mistake about the word nonplussed left me nonplussed, but only briefly. It was probably a lot worse for the guy who saw Miss Kane, actual, physical, again. This photograph reminds me of what I take to be the essence of museum-going: looking. A museum is for looking. The buzzword interactive requires, really, no more than attention and its object. 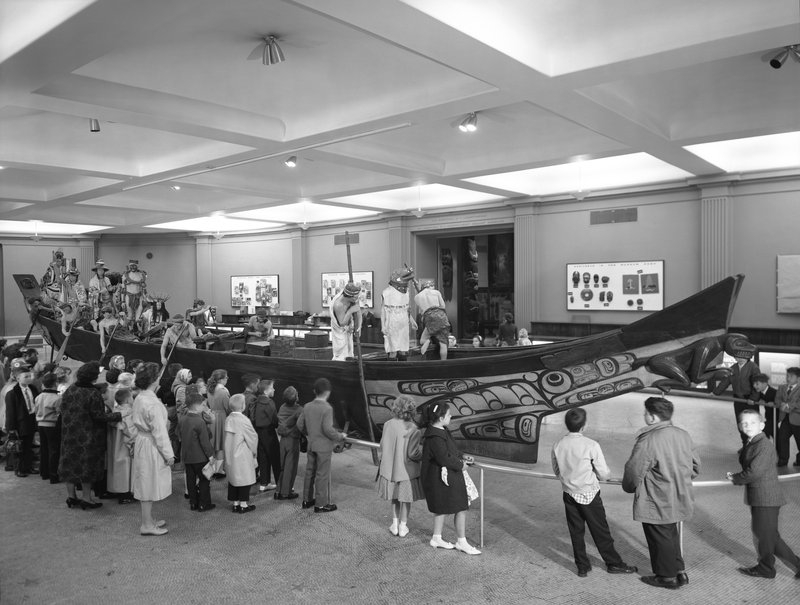 Note, for instance (in the larger version of the photograph), the expression on the face of the boy on the far side of the canoe (second from the right). Can one doubt that he's already planning to build this canoe at home? And speaking of looking: look at how these children are dressed. Like little ladies and gentlemen, as people used to say. They're representing their school! Even the boy with his shirttail sticking out is wearing what appear to be dress pants. The girls' white socks and shoes remind me of First Communion wear. Are those trenchcoats on the boys, or yellow raincoats? Only a color photograph knows for sure. Then you'd pass by this long, long Indian war canoe, about as long as three goddam Cadillacs in a row, with about twenty Indians in it, some of them paddling, some of them just standing around looking tough, and they all had war paint all over their faces. There was one very spooky guy in the back of the canoe, with a mask on. He was the witch doctor. He gave me the creeps, but I liked him anyway. He gave me the creeps too, long before I read Salinger, and much later in adulthood too. He was a scary guy. The canoe is now displayed minus its people. The New York Times tells that story, quoting curator Peter M. Whiteley: “I suppose some people will miss the Indians, just as some people miss Pluto.” Too true. When we think about the things that alter our lives in a moment, nearly all of them are bad: phone calls in the night, accidents, loss of jobs or loved ones, conversations with doctors bearing awful news. In fact, apart from a last-second touchdown, unexpected inheritance, winning the lottery, or a visitation from God, it is hard to imagine sudden good news. Virtually all the happiness-producing processes in our lives take time: learning new things, changing old behaviors, building satisfying relationships, raising children. This is why patience and determination are among life's primary virtues. For another pasage from Gordon Livingston, visit this post on Elaine's blog. Watching Mad Men for the first time tonight, I was surprised to see ad man Don Draper reading the paperback edition of Frank O'Hara's Meditations in an Emergency (1957). Don picks up a copy after seeing someone reading the book in a bar. Meditations was published in a very limited run: 90 hardcover and 900 paperback copies. Brad Gooch's O'Hara biography A City Poet notes that by 1960 the book was out of print. This episode of Mad Men focuses on Valentine's Day, 1962 (the night of A Tour of the White House with Mrs. John F. Kennedy). How does Don Draper get hold of this book so readily? Well, it's television. Is O'Hara's poem charting this character's future? Tune in next week. For several years now I've been reading fewer books, from start to finish, that is. Not that my reading has diminished. If anything, I'm reading more now, more words certainly, every day, every week, daily and Sunday newspapers, weeklies, fortnightlies, monthlies, book reviews, quarterlies, portions of books, encyclopedia articles, professional publications, computer manuals and magazines, student papers. I used to spend much of my time reading books in their entirety, for pleasure, study, and work: fiction, plays, poetry, essays, criticism, biography, scholarship, reportage, reference sources. . . .
My dad turns eighty today. Wholly cats! Eightieth-birthday cards, at least the ones I could find, are dreadful. Elaine suggested sending two fortieth-birthday cards. They proclaim forty to be the new thirty, which makes eighty the new sixty. At the Bibliothèque nationale de France, a wonderful photograph from the Lycée Condorcet. Can you spot Proust? For fourteen weeks in the winter and spring of 1956–57, I came into millions of American homes, stood in a supposedly soundproof booth, and answered difficult questions. I was considered well spoken, well educated, handsome, the very image of a young man that parents would like their son to be. I was also thought to be the ideal teacher, which is to say patient, trustworthy, caring. In addition, I was making a small fortune. And then — well, this is what happened. Van Doren took his lumps — he was fired from NBC, resigned from Columbia University, and pleaded guilty to perjury — and went on to make a life for himself and his family. In the early 1990s, he turned down a $100,000 fee to serve as a consultant to the film Quiz Show. Along the way, a little gyroscope helped him "survive and somehow find a way back." No link: this piece is available only in the magazine. Mr. Giuliani, who is 22, is the older of two children that Rudolph W. Giuliani had with his former wife, Donna Hanover. On Wednesday, he filed a lawsuit in federal court in Durham, N.C., accusing the university of bad faith by "aggressively" recruiting him as a high school student to play for Duke, then dashing his dreams by taking steps during his junior year in college to dislodge him from the team. In the lawsuit, he acknowledges that he may have misbehaved in February by flipping his putter a few feet, throwing and breaking a club, gunning his engine out of a parking lot and tossing an apple at a teammate's face in a skirmish. Rather than "quibble" about the details, the student said he had apologized for his own conduct, and said it pales next to the "bizarre" treatment he received from the school once Coach Orrin Daniel Vincent III took over the men’s golf program last summer. The complaint is worth reading. It refers to Giuliani as "Andrew" and to his fellow golfers as "boys," and it alleges that the coach implemented a "bizarre scheme" drawn from Lord of the Flies to remove young Andrew, "a rising senior," from the team. Somebody needs to grow up a little. "The Disadvantages of an Elite Education"
An elite education not only ushers you into the upper classes; it trains you for the life you will lead once you get there. I didn't understand this until I began comparing my experience, and even more, my students' experience, with the experience of a friend of mine who went to Cleveland State. I joined the staff of the Committee on Degrees in Social Studies at Harvard University in 2000. As tutor, then as lecturer, I advised senior theses, conceived and conducted freshman and junior seminars and taught the year-long sophomore tutorial, Social Studies 10, six times. The fractured nature of my appointment, renewed annually for six successive years while never amounting to more than 65 per cent of a full-time position in any one year, kept me on the margins of prestige and promotion even as it kept me there long enough to serve three chairmen of social studies, two directors of study and three presidents of Harvard. There's a lot to like in Pixar's WALL·E: echoes of City Lights, E.T., Metropolis, Star Wars, and 2001; several Apple jokes; a doofus CEO (played by Fred Willard) whose advice is to "stay the course" (sound familiar? ); the poignant use of an old musical; and a satiric, ominous portrait of a sedentary consumer-culture in which all food comes in cups. I'm very glad that I saw WALL·E, despite my reluctance about seeing "a love story about robots." What most impressed me in the movie is the expressiveness of WALL·E and EVE. These characters have minimal language and no faces, only heads and eyes (and EVE's eyes have no pupils). Thus feeling resides in tone, gesture, and head and eye movement. In creating these characters, Pixar's animators have worked out a grammar of eloquent emotion. So go see this love story about robots. When T.S. Eliot said that it is the journey, not the arrival, that matters. . . .
"But, at such an age, you will never return from so long a journey." What care I for that? I neither undertake it to return, nor to finish it: my business is only to keep myself in motion, whilst motion pleases me; I only walk for the walk's sake. Yes, I've e-mailed the Times, for the walk's sake. My son Ben (smart kid!) had the answer to today's mystery challenge: the text that I quoted is from an ad for the 1969 Woodstock Music and Art Fair. That ad seems quaintly innocent now, as elements of the so-called counter-culture have become the staples of any middle-American "fair" or "fest." I found the Woodstock ad in the July 20, 1969 New York Times, while searching for the details of the first concert I attended — Pete Seeger and the Hudson River Sloop Singers (August 4, 1969, at Gaelic Park in the Bronx). The Times seems rather serious about restricting the use of its materials, so I won't reproduce the Woodstock ad here. But a similar ad with identical text is available online. Ben's correct guess saves me from having to work up clues. I did have one ready: "A little less bottom end on the guitar, please." Anyone know the source? A mystery challenge, for you, reader. What event are the following paragraphs advertising? Crafts Bazaar — If you like creative knickknacks and old junk you'll love roaming around our bazaar. Food — There will be cokes and hot dogs and dozens of curious food and fruit combinations to experiment with. Work Shops — If you like playing with beads, improvising on a guitar, or writing poetry, or molding clay, stop by one of our work shops and see what you can give and take. Leave your best guess in a comment. You may guess more than once. No using the Google. The prize: undying fame in the form of a follow-up blog post. If no one gets it, I'll post the answer on Thursday. Ben Sakoguchi turns modern culture into orange crate art. 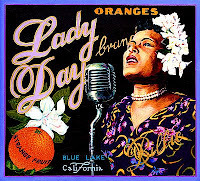 To the left, Lady Day Brand (1994). The Baseball Reliquary is a repository of the odd and unlikely. Its collections hold a piece of Abner Doubleday's skin, a Babe Ruth cigar (partially smoked), a Babe Ruth hot dog (partially eaten), Dock Ellis' hair curlers, and a tortilla bearing the likeness of Dodgers owner Walter O'Malley. Some of these objects appear to be real, while others prompt one to ask "What is 'the real'?" and other postmodern questions. The Reliquary might be described as a Museum of Jurassic Technology for baseball. Look for kindred souls. They are few and far between, and nothing is more precious. The most curious lot of the day was not the bracelet, however, or the singer's platform shoe collection ($15,000) or the paranoid note he once scrawled on loose leaf paper alleging that his record label was out to kill him ($7,000). It was not the suite of red leather furniture that conjured up images of the recreation room on a mother ship ($40,000). In tomorrow's New York Times, a report on the James Brown estate sale. What follows is too simple to be called a recipe, but the result is delicious anyway. The lemon zest gives this dish an ineffable zing. 1. Cook one box of pasta, minus the box. (I like penne.) You can do everything that follows as the water comes to a boil and the pasta cooks. 2. Smash and chop up some garlic, as much or as little as you like. I usually use six or eight cloves. 3. Scrape the zest from one lemon. A zester makes this work easy. If you remove the zest in long strands, chop them into smaller pieces. 4. Squeeze the juice from the now-denuded lemon. 6. Add a bag of baby spinach leaves to the pan, minus the bag. 7. Marvel at the way the spinach reduces so quickly in the heat. 8. It's really amazing, isn't it? 9. Add the lemon juice and zest. 10. Drain the pasta and mix with everything else. Serve with Parmesan or Romano cheese, or no cheese. Dry white wine goes well with this dish (on the side, in a glass). I like the idea that the formula for making money is a formula, or formulas, or formulae, 1,059 of them. But homemade fertilizer? Please, leave the "veil of secrecy" down. From the same issue of Popular Mechanics: Alkalize with Alka-Seltzer, A mystery EXchange name, "Radios, it is." "You'd almost think it was in the Bible, for God’s sake," said Paul Botwin, a veteran of World War II and, later, the New York soda wars, working in the business and watching other local brands come and go. "The times passed them by. Coffee survived." From a New York Times article on Manhattan Special, an espresso soda that now ships anywhere in the continental United States. Manhattan Special is made in — where else? — Brooklyn. 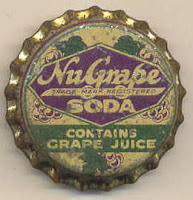 "I Got Your Ice Cold NuGrape"
¹ In "Step Right Up," from the 1976 recording Small Change. Symptoms of seasonal allergies and colds overlap, but studies suggest there are ways to tell them apart. The first is the onset of symptoms. Colds move more slowly, taking a day or longer to set in and gradually worsening — with symptoms like loss of appetite and headache — before subsiding after about a week and disappearing within 10 days. But allergies begin immediately. The sneezing is sudden and overwhelming, and the congestion, typically centered behind the nose, is immediate. Allergy symptoms also disappear quickly — almost as soon as the offending allergen, like pollen, is no longer around. Then there are hallmark symptoms of each. Allergies virtually always cause itchiness, in the eyes, the nose, the throat, while a cold generally does not. Telltale signs of a cold are a fever, aches and colored mucus. If confusion persists, consult your family tree: studies show that having a parent with allergies greatly increases your risk, particularly if that parent is your mother. Yes, even figurative trees cause allergies. The clue for 44-Across in the April 30 New York Times crossword — "Little fingers or toes" — has brought me two new words. Minimus is the name for the smallest finger or toe. The plural is minimi (MIN-ih-my). Having typed these words, I'm not sure that I will ever use them again. In 1991, medical student John Phillips borrowed Mother Goose's little piggies to create Latin names for the toes. They seem not to have caught on. For more on the naming of parts, Wikipedia's article on the ring finger is amazing reading. It makes sense that we have a richer vocabulary for fingers than toes. Fingers exhibit greater variety across the set of ten than toes do (each toe, bigger or smaller, is just another piggy). Fingers are, we might say, closer to us, right under our eyes and noses (and sometimes in them). Fingers are expressive, so it makes sense that we are more expressive about them. There's a condo building called Odyssey Lofts, and the sign says "If you lived here, you'd be Homer by now." And the website says "Homer is where the heart is." I'm still inspired by the passage on George Eliot from Jonah Lehrer's Proust Was a Neuroscientist that I posted last week. It's one of many passages that show Lehrer to be an engaging and graceful writer. But the enthusiasm with which I began reading his book waned as I kept going. Proust Was a Neuroscientist was a disappointment. One problem: an exaggerated emphasis on the purported difficulty of modern art, music, and writing. Swann's Way offers "fifty-eight tedious pages" before Proust's narrator tastes the madeleine. Fifty-eight? That depends on the edition. Tedious? When I read the first fifty pages of Swann's Way (Penguin edition) in one sitting, I knew that I had found my way to the greatest reading experience of my life. The tendency to exaggerate difficulty is most prominent in Lehrer's discussion of Stravinsky and The Rite of Spring. A sampling: "a monstrous migraine of sound," "a gunshot of chromatic bullets," "clots of sound," "sadistic newness," "epileptic rhythm," "schizophrenic babble." Granted, Lehrer is taking into account the anger and incomprehension of some of the work's first listeners. But his characterizations of Stravinsky's work are often cast in terms of a present-day "we" still pained by the music: "Our cells can sense the chaos here; we know that this particular wall of sound is irresolvable. All we can do is wait. This too must end." Another problem: Lehrer is sometimes remarkably dismissive, most conspicuously in his chapter on Gertrude Stein and Tender Buttons. Stein's poor reader must trek on, "suffering through her sentences," which offer "one jarring misnomer after another" in a "drift toward silliness" and "literary disarray." Though Lehrer notes that Stein's sentences "continue to inspire all sorts of serious interpretations," he doesn't engage what serious readers (Marjorie Perloff, for instance) have made of Tender Buttons. 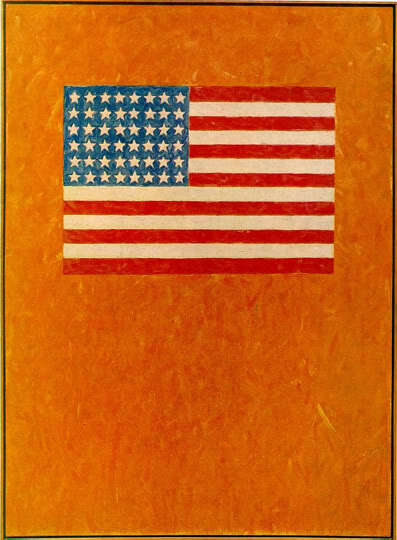 And his breezy observations about Stein's "lack of influence" ("her revolution petered out, and writers went back to old-fashioned storytelling") would come as a surprise to many contemporary poets (John Ashbery, Charles Bernstein, Clark Coolidge, Lyn Hejinian, and Bernadette Mayer, for instance). Jonah Lehrer is writing with a noble purpose: to encourage dialogue between the humanities and the sciences. I'm not sure that readers of Proust Was a Neuroscientist will be moved to read Proust or Stein or listen to Stravinsky if they haven't done so before. But I am thinking that it might be fun to read Middlemarch again — a thought I never imagined having before reading this book. 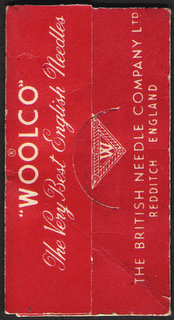 At the time [the 1910s] English Needles and Sewing Accessories were recognised to be the finest in the world, so naturally Woolworths bought British not only for the shops in the UK, but also for export to the United States of America and Canada, where the items were sold for five or ten cents. I found this "WOOLCO" item while helping to clean out an old house this morning. 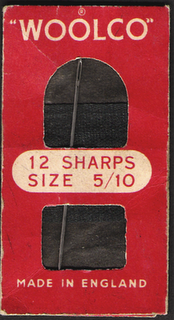 As you can see, just one sharp (a general purpose household needle) remains in the package, whose design is patented (no. 793608/34). It's difficult to decide how old this dowdy-looking package might be. The Woolco chain began in 1962, yet the Woolworth Virtual Museum shows British products, clearly pre-1962, bearing the Woolco name. I would guess that this package is, at the latest, from the 1950s. Redditch began as a center of needle-making in the Middle Ages, soared to great industrial heights in the 19th century, and is now home to the Forge Mill Needle Museum, whose gift shop sells size 5/10 sharps. Photograph of Proust at twenty by Paul Nadar, from The World of Proust as Seen by Paul Nadar, ed. Anne-Marie Bernard (Cambridge: MIT Press, 2002). In the mid-1980s, when Elaine and I lived in Brookline, MA, we patronized a corner grocery whose owner once said to us (and I wish I could remember the context), "It's good to get away from reality once in a while." That seems as good a reason as any to see Kit Kittredge: An American Girl (dir. Patricia Rozema), now in theaters. Kit (Abigail Breslin) is a ten-year-old aspiring reporter who cracks a multi-city crime spree in Depression-era Ohio. Yes, the Depression is on, but the movie presents a world in which individual acts of kindness render unnecessary any larger considerations of social justice. Be nice to that hobo! He will mark your gate with a kindly hobo sign and go back to the hobo jungle feeling better about himself (and you). I saw this movie with Elaine and Rachel this afternoon, and for the first time in my life, I found myself the only man (and only male, for that matter) in a movie audience. And our party of three was the only group of moviegoers in which each member was over twenty-one (or over twelve, for that matter). Unexpected pleasures: Wallace Shawn plays a cranky newspaper editor, and there's a tip of the hat (or cap) to Sullivan's Travels. Not bad for a kids' movie. Another story of a parental encounter with a star: in the 1950s, my mom and dad found themselves in a Schrafft's, being served by Kenneth Nelson. They recognized him as Willie Baxter, from the 1951 musical Seventeen, after which, as Wikipedia notes, Nelson "found little work for the remainder of the decade." My tactful parents didn't say anything. In 1960, things began looking up for Kenneth Nelson: he originated the role of the Boy in The Fantasticks. A free white-noise generator that fits in a browser tab: SimplyNoise (found via Lifehacker). I sometimes use the free Mac program Noise at work — it's amazing how many distractions it masks and how easy it is to forget that it's running. "You know what it says here? They're gonna take out all our phones and put in them kind with dials on 'em!" EXcalibur? EXcelsior? Only the operator knows for sure. 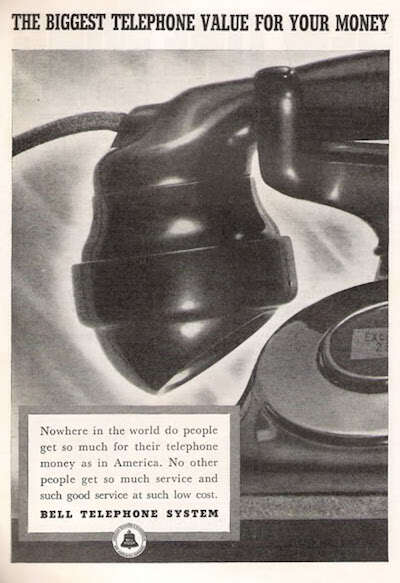 This Bell Telephone advertisement appears in the always rewarding and seemingly inexhaustible June 1938 issue of Popular Mechanics. 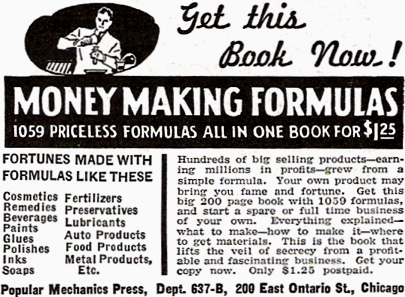 From the same issue: Alkalize with Alka-Seltzer, "MONEY MAKING FORMULAS," and "Radios, it is." Upon graduation from Columbia University in the early Twenties, Mr. [William] Black followed the normal routine of job hunting. Unable to find employment that suited him, he went into business for himself. He opened a nut store under a staircase in the basement of a Times Square building. From this subterranean start the venture grew into a chain of eighteen nut stores under the name Chock Full O' Nuts [sic]. The business thrived until the depression hit. Mr. Black decided nuts were a luxury. From 1931 to 1933 he changed all the stores into quick-order luncheonettes. 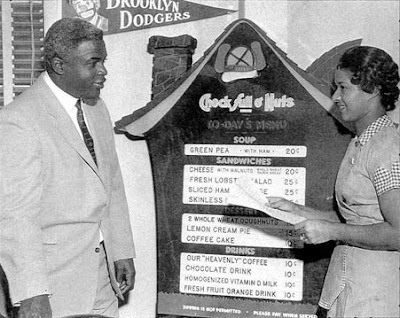 The restaurants specialized, as they do today, in nutted cream cheese sandwiches and coffee. Soups and pies were added to round out the menu. Lobster salad and coffee, please. And a piece of lemon cream pie. William Black's idea of "food" seems to have been stuck in a time warp, a severely minimalist time warp: No Coke. No Pepsi. No fries. No chips. No wonder the restaurants began disappearing in the 1970s. Chock full o'Nuts' Chock Cafés still offer a limited menu, including the Chock Classic ("datenut bread with cream cheese") and whole wheat donuts (not doughnuts). Whole wheat: that's why the doughnuts were so strange. You can find more commercials in the timeline at the company website. ¹ The capitalization and spacing are wrong, but that's the company way. Asked at a town hall-style meeting in Fargo, N.D., about any decorating plans for the Lincoln Bedroom, Obama described a visit to the White House after he became a U.S. senator. "You have all these mementos of Abraham Lincoln, but you have this flat-screen TV in there," Obama told the crowd at the outdoor event. "I thought to myself, 'Now, who stays in the Lincoln Bedroom and watches [ESPN's] 'Sports Center'? You've got your clicker. . . . That didn't seem to me to be appropriate. So I might take out the TV, I don't know. "You should read when you're in the Lincoln Bedroom! Reread the Gettysburg Address. Don't watch TV." 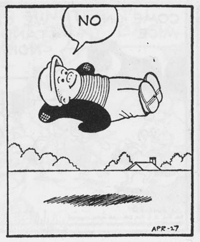 Sluggo has no problem shirking, but for the rest of us, Ramona Creel's 20 Ways to Say No might be helpful. I am not taking on any new responsibilities. And so on. No. 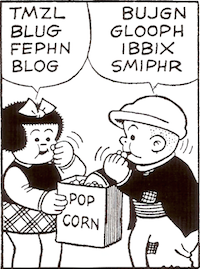 This Ernie Bushmiller illustration has been called "the greatest Nancy panel ever drawn." The Wrecking Crew (2008, dir. Denny Tedesco) is a documentary film about the Los Angeles studio musicians heard on recordings by the Beach Boys, the Byrds, Nat King Cole, the Mamas & the Papas, the Righteous Brothers, the Ronettes, Frank Sinatra, and many others. The director is the son of guitarist and Crew member Tommy Tedesco. The film has been shown at festivals and has a screening tonight in Los Angeles. No distribution yet. [R]eading is one of the cheaper recreations: after listening to the radio probably the cheapest. After reading this essay, I did some rough arithmetic and found that the cost of my Proust habit has been about 25¢ per reading hour. Cheap! "[A] process and an unfolding"
If science could see freedom, what would it look like? If it wanted to find the will, where would it search? Eliot believed that the mind's ability to alter itself was the source of our freedom. In Middlemarch, Dorothea — a character who, like Eliot herself, never stopped changing — is reassured that the mind "is not cut in marble — it is not something solid and unalterable. It is something living and changing." Dorothea finds hope in this idea, since it means that the soul "may be rescued and healed." Like Jane Austen, a literary forebear, Eliot reserved her highest praise for characters brave enough to embrace the possibilities of change. Just as Elizabeth Bennet escapes her own prejudices, so does Dorothea recover from her early mistakes. As Eliot wrote, "we are a process and an unfolding." The Internets are filled with generous and pseudonymous people, one of whom, Aronnax, has given us GrApple, a set of four beautiful Firefox themes for Mac. I'm partial to GrApple Delicious (blue), which I think is the most beautiful browser theme I've ever seen. Yes, GrApple looks like Apple's Safari, but better. As Aronnax's page notes, GrApple looks "up to 3 times more beautiful than Safari and up to 5.5 times more beautiful than Opera 9." Thanks, Aronnax! The above image comes from 3rd Ave. El (1954), an Oscar-nominated short film by Carson Davidson. Its elements are delightful: the El, a few riders, a shiny dime, Franz Joseph Haydn's Concerto in D for Harpsichord, and "the city." The film's credits list six actors, in what appears to be order of appearance (a photographer, a drunk, and father and child, a couple out on the town). 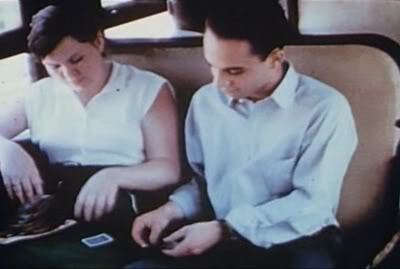 These cardplayers though are evidently genuine commuters, caught perhaps on their way to work. I found 3rd Ave. El as an extra on the DVD release of The Shvitz (1993, dir. Jonathan Berman), a documentary about old-school steambaths. (Shvitz is Yiddish for "sweat.") But you can also watch 3rd Ave. El online, via the Internet Archive. In eraserdom, black is the new pink. 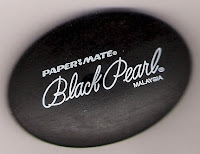 Latex- and PVC-free, the Black Pearl eraser looks great and plays well with pencils. The package says that this eraser "fits comfortably" in the hand, but I wouldn't know — I hold it with my fingers. I paid $1.47 for two (a his 'n' hers set).